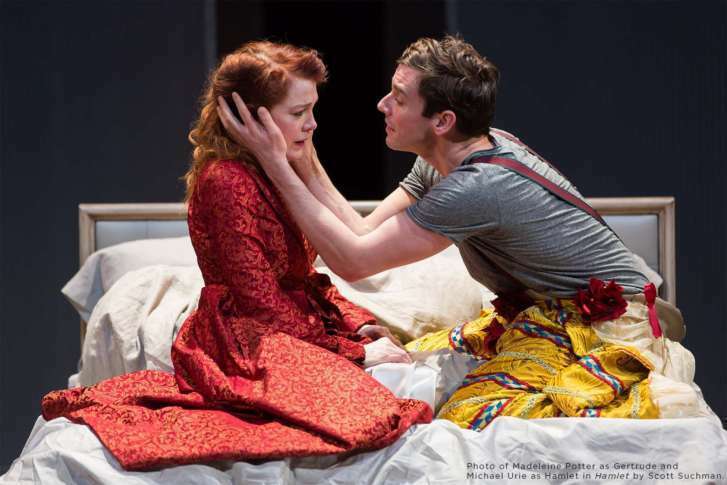 Actor Michael Urie joins WTOP to discuss a special spy version of “Hamlet” now at Shakespeare Theatre Company. WASHINGTON — William Shakespeare’s “Hamlet” is a tragic revenge tale ripe for any era, but you’ve probably never seen it presented quite like this with a modern espionage twist. That’s the fresh conceit by Shakespeare Theatre Company at Sidney Harmon Hall in Penn Quarter (Jan. 16-March 4), fittingly around the corner from the International Spy Museum. Originally set in Denmark during the Middle Ages, Prince Hamlet (Urie) is visited by the ghost of his late royal father (Keith Baxter), who claims he was murdered by his brother Claudius (Alan Cox), who seized the throne and married the widowed Gertrude (Madeleine Potter). The spiritual weight of suicide — and revenge homicide — haunt Hamlet’s conscience. By contrast, Hamlet grieves that his own father was killed before getting a chance to repent. This universal soul-searching makes “Hamlet” one of Shakespeare’s most timeless works. This particular production is made extra relatable by the aforementioned spy elements. It’s fascinating to see how each famous character is woven into the spy arena. You also might notice some contemporary similarities on a geopolitical level. Urie is very familiar, having played Horatio 10 years ago at California’s South Coast Repertory.